Abacus Healthcare will be demonstrating its popular Gemini and Scorpio power assisted baths at the Kidz-to-Adultz-Middle exhibition and providing essential literature regarding product ownership and Disabled Facilities Grants. Kidz-to-Adultz-Middle is organised by Disabled Living and provides a friendly and free opportunity for parents, therapists and carers to test and compare the latest products and services for disabled children and young adults. 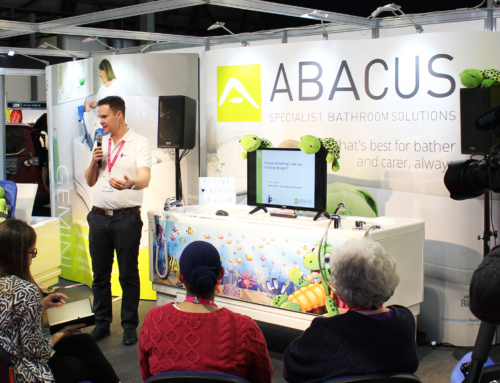 Product Specialists from Abacus will be available throughout the show to assist professional and consumer visitors on a one-to-one basis with their specialist bathing needs. They will be able to offer expert advice on product suitability and the process involved with obtaining an Abacus bath. Visitors will be able to take away a range of printed guides and case studies illustrating the benefits of bathing verses showering and how funding can be achieved more easily through a Disabled Facilities Grant. As part of the ‘#BathingIsBetter’ campaign, this literature includes simple information for families and more in-depth details for healthcare professionals. All visitors are encouraged to share their experiences and advice on Facebook and Twitter using the campaign hashtag. Downloadable pdfs of the guides are also available on the Abacus website in the new ‘Downloads’ Section. In terms of products on stand D4a, Abacus will be demonstrating the Gemini and Scorpio baths as well as a variety of supports and cushions enabling the perfect fit for every client. The power assisted Gemini is a leading choice for families and therapists as it is the only bath available that has a double lift feature. This allows the bath to lifted in two stage – firstly to immerse the bather in a controlled manner and secondly to raise the Gemini up to a safe working height and for easier eye-level engagement. When entering the Gemini bathers can position themselves, or be positioned, on the integrated platform which reduces the need to be lowered into the bath. This platform ensures transfers, changing and drying are more efficient and comfortable for the bather whilst carers can avoid excessive bending or lifting. The Scorpio will also be available for trials – it is a height adjustable bath that includes a powered bather transfer seat. This seat provides safe access for disabled bathers as they can be lifted rotated and lowered into the bath which negates the need for physical moving and handling assistance. The longer 1800mm version will be on show which provides more room for adults and older teens.